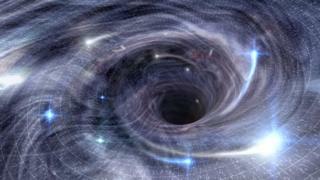 A dozen black holes may lie at the centre of our galaxy, the Milky Way, researchers have said. A new analysis provides support for a decades-old prediction that “supermassive” black holes at the centres of galaxies are surrounded by many smaller ones. However, previous searches of the Milky Way’s centre, where the nearest supermassive black hole is located, have found little evidence for this. Details appear in the journal Nature. Charles Hailey from Columbia University in New York and colleagues used archival data from Nasa’s Chandra X-ray telescope to come to their conclusions. They report the discovery of a dozen inactive and low-mass “binary systems”, in which a star orbits an unseen companion – the black hole. The supermassive black hole at the centre of the Milky Way, known as Sagittarius A* (Sgr A*), is surrounded by a halo of gas and dust that provides the perfect breeding ground for the birth of massive stars. These stars live, die and could turn into black holes there. In addition, black holes from outside the halo are believed to fall under the influence of Sgr A* as they lose their energy, causing them to be pulled into its vicinity, where they are held captive by its force. Some of these bind – or “mate” – to passing stars, forming binary systems. Previous attempts to detect this population of black holes have looked for the bright bursts of X-rays that are sometimes emitted by black hole binaries. A search for the X-ray signatures of low-mass black hole binaries in the Chandra data turned up 12 within three light-years of Sgr A*. By extrapolating from the properties and distribution of these binaries, the team estimates that there may be 300-500 low-mass binaries and 10,000 isolated low-mass black holes surrounding Sgr A*. Gravitational waves are ripples in the fabric of space-time. They were predicted by Albert Einstein’s general theory of relativity and detected by the Ligo experiment in 2015. One way these ripples arise is through the collision of separate black holes.